Nag Ashwin’s bilingual stars Keerthy Suresh and Dulquer Salmaan. Telugu filmmaker Nag Ashwin will bring the story of South Indian screen legend Savitri’s life to the big screen on May 9. 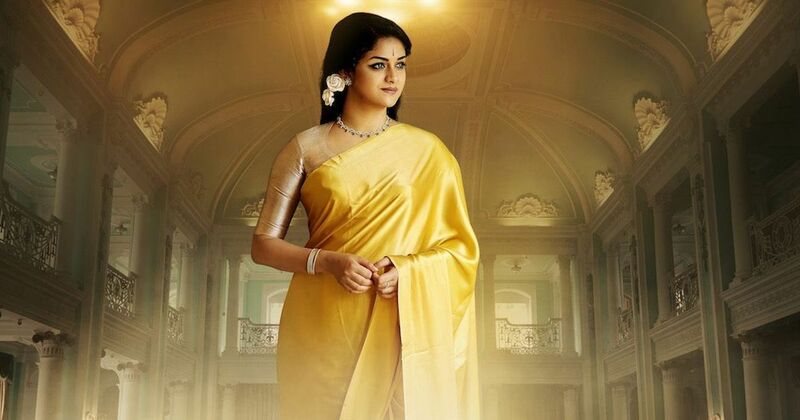 Titled Mahanati in Telugu and Nadigaiyar Thilagam in Tamil, the film stars Keerthy Suresh in the lead and Dulquer Salmaan as Savitri’s on-screen and off-screen partner Gemini Ganesan. The Vyjayanthi Movies and Swapna Cinema production also stars Vijay Deverakonda, Samantha Akkineni, Mohan Babu, Shalini Pandey, Krish, Prakash Raj, Tharun Bhasker Dhassyam, Rajendra Prasad, Malavika Nayar, Bhanupriya and Anushka Shetty. On May 1, the film’s five-song soundtrack composed by Mickey Meyer was released. 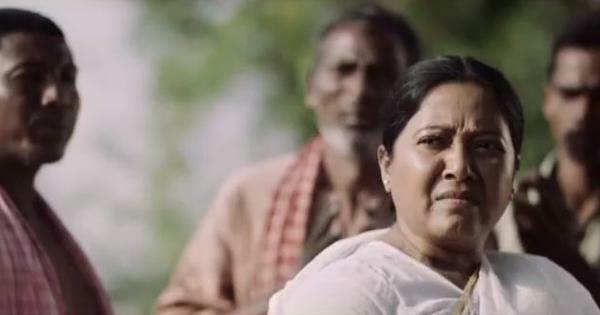 Ashwin attempts an exhaustive account of Savitri’s turbulent life of 47 years. Born on December 6, 1934, Savitri began her acting career in stage productions as a child. She made her Telugu cinema debut in LV Prasad’s Pelli Chesi Choodu in 1952. What followed was a highly successful career in the Telugu and Tamil film industries with a long list of hits including Devadas (1953), Missamma (1955), Mayabazar (1957), Kalathur Kannama(1959), Pasamalar (1961), Karpagam (1963), Mooga Manasulu (1964) and Thiruvilayadal (1967). For his research on Savitri, Ashwin referred to five books – one in English and four in Telugu – listened to audio interviews of the actress and spoke to her peers. Apart from building a reputation as an exceptional performer (she was known as the “queen of tragedy”) Savitri was a producer, director, singer – and race car driver. She also had a vintage car collection. In an interview with Scroll.in, Ashwin said that he has not felt the need to censor anything about Savitri’s life, including her tumultuous relationship with Gemini Ganesan. Savitri was Ganesan’s third wife and she had a daughter and a son with him. Neither did he want to omit details of her intermittent financial struggles owing to films that did not perform well at the box office, or her battle with alcoholism, which culminated in her early death. Dulquer Salmaan and Keerthy Suresh. Image credit: Vyjayanthi Movies. In the build-up to Mahanati’s release, the makers have released several stills from the film and trivia about Savitri. A significant portion of the biopic is likely to be dedicated to Savitri’s relationship with Ganesan. P Pulliah’s Manam Pola Mangalyam (1953) was one of their first films together. The duo went on to act in numerous productions, such as Guna Sundari (1955), Maheswari (1955), Maaman Magal (1955), Prema Paasam (1956), Iru Sagodharigal (1957), Kadan Vaangi Kalyanam (1958), Kalathur Kannamma (1960), Manithan Maravillai (1962) and Hello Mister Zamindar (1965). Keerthy Suresh and Dulquer Salmaan in Mahanati. Image credit: Vyjayanthi Movies. 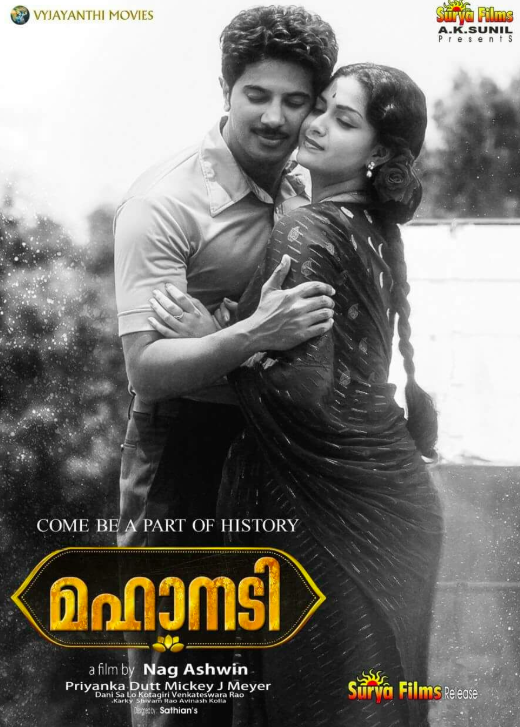 Mahanati. Image credit: Vyjayanthi Movies. There is speculation that Vijay Deverakonda and Samantha Akkineni’s characters – Vijay and Madhuravani – will relay Savitri’s story in the film. “Sam [Akkineni] is the driver behind the wheels when it comes to the film,” said Swapna Dutt Chalaseni, the producer of the film. The photographs show how the team recreated KV Reddy’s 1957 hit fantasy drama Mayabazaar, including getting the costumes and jewellery right. Several filmmakers and actors who worked with Savitri, including KV Reddy, will feature in the movie. A teaser that came out on May 6 introduced Telugu actor Krish Jagarlamundi as Reddy in the film. What discussion about Mayabazaar is complete without SV Ranga Rao, who played the half-man, half-demon Ghatotkacha in the film? Mohan Babu will play the legendary actor. A video introducing Babu as Ranga Rao shows an uncanny resemblance between the two. Acclaimed filmmaker LV Prasad, who launched Savitri’s career through Pelli Chesi Choodu and Missamma, will be brought to life by Srinivas Avasarla in Mahanati. A teaser offers shows Avasarla as Prasad, clad in a white kurta with his trademark spectacles, examining a film reel.